As a recruiter or human resources professional, finding qualified candidates for hiring is an important part of your job. Sorting through endless resumes and profiles to find a gem is a little like finding a needle in a haystack. With the added pressure of managers, your goal is to make a decision quickly. A background check helps narrow your choices and, when one candidate's screening reveals a mark on his record, you move on to the other candidates. You hire the perfect employee, with experience and a clean record, and you feel that your job is done. Small businesses and enterprise businesses alike must abide by the rules of the Fair Credit Reporting Act (FCRA) when hiring and denying employment. Here's how. Adverse action is any action taken to deny or terminate employment, credit, promotion or other benefits due to information discovered in a background screening, credit or other consumer report. Think about it for a moment: Are you positive that all of the information about you on credit reports, employment records, criminal records and other background records is true and correct? 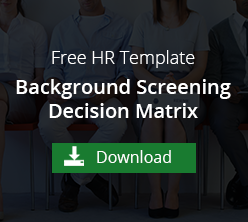 If a job candidate is denied employment based on the information discovered during a background screening, they are allowed the right to view and dispute the information used against them. In fact, employers must also follow a strict process of gaining authorization and consent to run a background check as well. Running a background check, without authorization and consent, could lead to litigation for the employer. Many companies, especially those who don't hire often, are also unaware of the consequences of denying employment without adverse action notices. Every individual who has been subjected to a background check, and not approved, must receive an adverse action notice. In order for employers to remain FCRA-compliant, they must follow a particular schedule when notifying the applicant. A copy of "A Summary of Your Rights under the Fair Credit Reporting Act"
Employers must wait until after the pre-adverse action notice before taking adverse action, although the FCRA doesn't specify how long. According to the Federal Trade Commission, five business days can be considered a reasonable amount of time. Should an applicant choose to dispute the findings of the background screening, they will be able to contact the consumer reporting agency or background screening provider to review the records. The reporting agency or screening provider will then be able to notify the employer if the records indeed belong to the applicant or if they do not. These professional agencies help verify the records and notify the employer if they should proceed with adverse action. Because of the severity of penalties suffered if an employer's hiring process is not FCRA-compliant, and because of the amount of time and specifics required to ensure FCRA-compliance, many businesses opt to hire a professional background screening company. A professional reporting agency, especially one that specializes in FCRA compliance, can be a great partner during the hiring process. As a human resources professional, you only want to hire the most qualified candidates for their employer. A background screening partner ensures a smooth process of hiring and/or denying employment and takes on some of the compliance responsibility.